Our post-processing will take your product from a rough finished product to a clean, ready-for-market, superb quality presentation. Many alternative production facilities are limited as to how far they can take a product into completion and ready for the market. 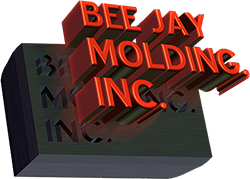 At Bee Jay Molding, we take pride in the fact that we can help you from conception to completion. Bee Jay Molding provides assembly and packaging to your specifications. Both are tailored to a customer's needs as they define them. Here's a process used for printing across relatively small areas on plastic items, and when the area to be printed is difficult to reach or is contoured. This method uses a silicone ball or pad to lift the color and design from a plate and then transfer it onto the surface of the item to be imprinted. An inked image is transferred from a photo-etched plate to a thick, soft silicone pad. The pad is then pressed against the plastic part. The pad can wrap itself as much as 180 degrees around a small object, and ink coverage is excellent. One color is done at a time, but registration between colors is good enough to allow four-color process printing. Ultrasonic welding post-processing uses an acoustic tool to transfer vibration energy through the plastic parts into the weld area. The friction of the vibrating molecules generates heat, which melts and welds the plastic. When the plastic reaches a molten state, the vibration stops. Apply pressure while the molten plastic solidifies and you have a welded joint. Hot stamping post-processing is a decorating process in which a metal foil or pigment is placed on carrier films. A heated die is used to press against the foil and plastics, and the foil or pigment is released from the carrier film. It is the heat and the pressure of the process that bonds the decoration to the substrate. Hot-foil stamping is a popular process for decorating plastics. The foil must be compatible with the plastic substrate to be decorated.